The Kent Junior Schools’ Cross Country Championships which took place at the Kent Showground on Saturday was a sight to behold! Over 80 primary and preparatory schools and more than 1380 children from across Kent converged on Detling hill on what was (unusually for this event) a bright, sunny morning. Open to all, the races offer the opportunity for children who may never have competed before to run; the course a dull, but challenging circuit of the Showground, 1200m for Years 3 and 4 and 2200m for Years 5 and 6. 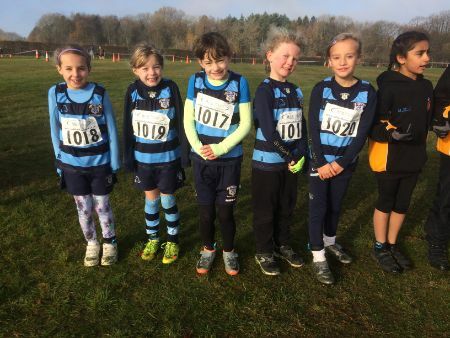 For four of the five Y3 Saint Ronan’s girls, it was the first time they had donned the blue-hooped cross country vests but they kept their nerves under control as they assembled on the start line with 142 jostling girls. At the sound of the airhorn, they streamed away up a gentle climb for about 200m before turning sharp right into a descent of around 100m. A flat stretch followed and then a long, taxing ascent of around 300m. Cresting the ridge, the girls then had a downhill run of about 400m before rounding the bend and heading into the finishing straight, cheered on by the crowds. First to cross the line for Saint Ronan’s was Lucienne SD, in a fabulous 13th place (06:29). Eleven seconds behind her, Jemima P (29; 06:48) had an excellent race as did Olivia G (35; 06:56), both girls in their first outing for the school. Tilly TY was next to cross the line in 79th (07:40) and little Micaela M put on the best show of determination of the morning, moving through from just in front of the sweepers to finish 123rd (09:47). We were immensely proud of all the girls – great potential for a future cross country team!